Much of what the Kurds claim as their own unique culture is actually borrowed from older cultures, such as the Assyrians, Armenians, and Aramean. In fact, much if not all of the land in Eastern Turkey that the Kurds claim as their own once belonged to the Armenians. It is hardly surprising, then, that the Kurds assisted in the Turkish genocide of Assyrians and the 1915 genocide of Armenians. 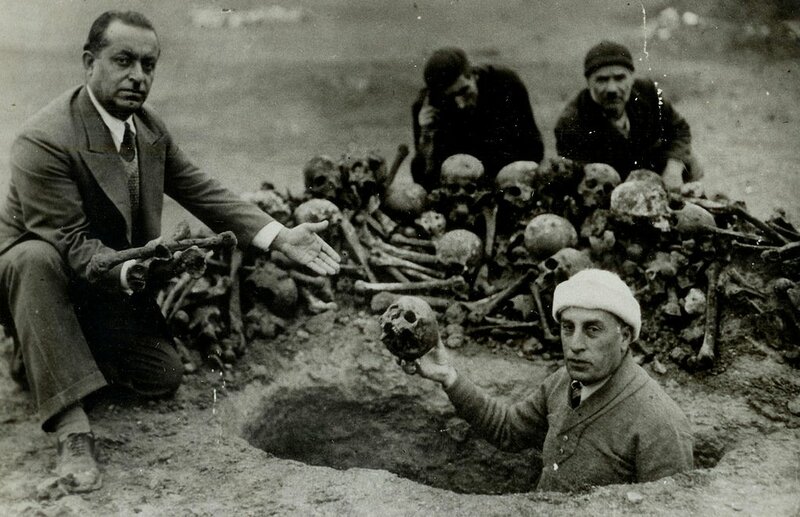 A group of men excavates the remains of victims of the Armenian genocide in modern day, Deir ez-Zor, Syria, 1938. (Photo: Armenian Genocide Museum Institute). On the Nineveh plains of northern Iraq, the Kurds dwell in cities such as “Dohuk” (formerly known by the Assyrian name of Nohadra). But these cities are “theirs” only in that they have established a relatively recent presence there.Employing the criteria of cultural identity and thousands of years of historical authenticity, these lands are, and have been, uniquely Assyrian. 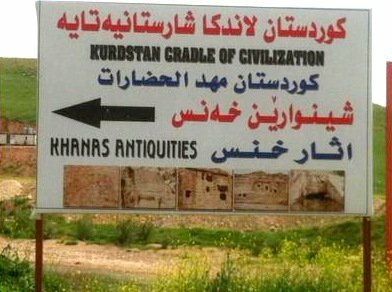 The Kurds were essentially “given” these lands in the early 1970s as a means of drawing their eyes away from the oil-rich lands in and around the Iraqi city of Kirkuk. To this end, there were large migrations of Kurds into Dohuk which displaced, often forcibly, Assyrians who had far greater legal and historical claims to these lands. This is a tactic commonly employed by the Kurds when attempting to ascribe validation to their “sacred quest” of establishing a Kurdish state – something which has never existed at any point in recorded history. 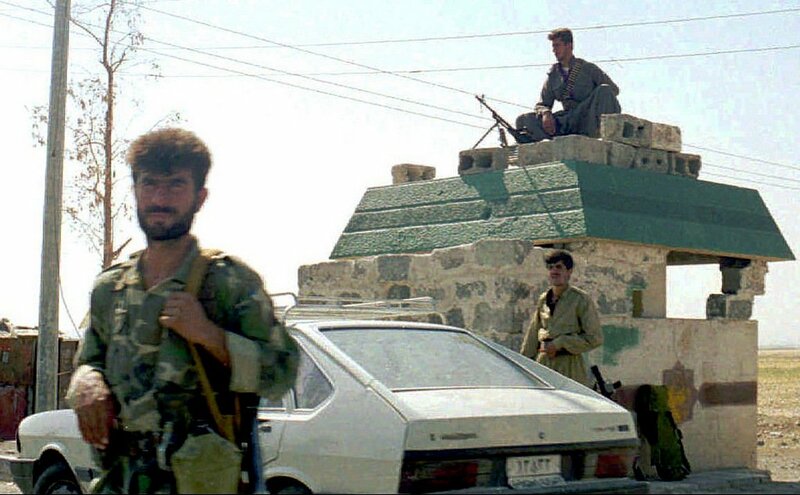 By defining “Kurdistan” as any place where Kurds happen to dwell at any given point, they seem to be going by the maxim “possession is nine-tenths of the law” – which may work well in determining criminal liability, but not so well in determining one’s homeland.In the early 1970s, the Kurds of Nineveh began to fall into what would become a familiar pattern of being used as a pawn of U.S. interests. In this instance, they betrayed their host country when the U.S. – through its puppet, the Shah of Iran – began arming them and encouraging them to rise up against the government. In 2011, imams in Dohuk encouraged Sunni Kurds to destroy Christian churches and businesses. In response, shops were attacked and clubs were besieged by mobs of people numbering in the hundreds. Hotels and restaurants were attacked with small arms fire.In recent years, Kurds have continued acting disingenuously towards Christian minorities, including Assyrians and even Yazidis. Their abuses have gone far beyond historical revisionism – an example of which can be seen in the picture below. This was also seen when they took refuge in northern Syria in the early 19th century and proceeded to drive Arabs and Armenians out of numerous towns. No one has been able to explain the Kurds to me so I thank you for your article. This was most helpful and I hope you continue. You’re very welcome! It’s certainly a topic where most of the information available on mainstream media is almost entirely one sided. That’s why I’ve been focusing on bringing the other side of the story to light. I appreciate you reading my articles. i read a book written by an American diplomat and i don’t recall the title but in the end one got the impression they are and have always been the ‘hapless Kurds’ ~ the book i read did nothing compared to what is revealed herein, Thank you very much. Actually my apologies I am going to add that video to another article on my site titled Syria: Kurdish SDF and Daesh an Unholy Alliance Consecrated by the U.S.